I just got a tattoo and hate it. Can I get it removed as soon as possible? I'm 16 and just got my first tattoo. I got it as a birthday present, but I hate it and want it gone. I want it off my body. I realize I don't want a tattoo at all. It's maybe 3 hours old. Can I get it removed as soon a possible? After laser tatto removal I have a headache that won't go away. What can I do? I had 4 laser tattoo removal treatments. After 4 weeks I have been suffering from a headache that does not go away. I have tried everything — migrane tablets, antibotics and nothing works. Could you please advise me on what to do? I've missed two weeks of work because of this. Does the skin get uneven after peeling from laser tattoo removal? I have two tattoos on both hands. It's been 16 days since the first laser tattoo removal session. 40% of the ink from my one tattoo has been removed and the rest is fading. But while the skin dried up and peeled, the tattoo portion got uneven. I use A&D ointment and both the tattoos are very itchy now. The small one sometimes gets reddish. Sometimes the peeled portion gets white. Please suggest what to do. I want to remove only a section of my tattoo and keep some of it. How much of the surrounding area will TCA treatment affect? A couple inches? My tattoo is composed of watercolor ink adjacent to a section of black ink. I want to remove the black ink but keep the watercolor adjacent to it. I want to know how much area of the watercolor tattoo I will be risking to fade while fading the black ink. I had 10 tattoo removal sessions on black ink tattoos. They still haven't gone. What should I do? 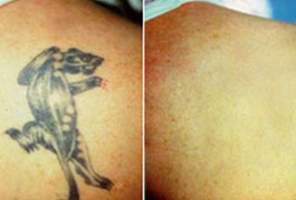 I've done maybe more than 10 sessions of laser tatto removal on 5 small and medium tattoos. They are already blurred, but are still there. After my last session they became hyperpigmented. They're reddish and look burned. I'm already depressed because of them. I don't know what else to do to make them completely gone. Can I recieve laser treatments while breastfeeding? I've had 5 laser treatments to remove my tattoo. It's almost gone. But, I stopped treatment to have a baby. I've been reading and doing research. I'm just not sure if it'll get into my bloodstream and become damaging to the baby. I had laser tattoo removal a few days ago. My ankle is swollen going down into foot & up into calf, and now large blisters, hot & sore. I’ve had the treatment three times previously without any ill effects so I'm concerned why this has happened on this occasion. My skin turned dark red after the laser tattoo removal. Will the redness go away? It's been 3 months and it's still dark brownish red. I did microblading 3 months ago. I immediately regretted it and few weeks later I did laser tatto removal (Q switch). So far I did 3 laser sessions and every time it makes my skin red and it doesn't remove the ink. I tried at different places and it's always the same result. I now have two very red eyebrows with the tattoo. It's really bad. 2 days after my lazer i got a UTI . Test come back neg. Peeing out the ink can give you psin ? I have been two times now to get tested for a UTI and eveything is OK. If im my body is getting rid of the ink particles through my urine will it give me a feeling like cystitus? Can laser break up oxidized and darkened eyebrow pigment inks? Particularly titanium and iron metals pieces. Are these metal pieces impossible to break up? I have had darkening of my semi-permanent eyebrow upon my first laser removal with Picosure yesterday. It has turned it from light brown to a darker brown. Is Picosure still a good option for me without bad side effects? It's all black ink, mostly shading on my chest. I’ve had 10+ tattoo removal treatments on a small tattoo (black ink) on the upper part of my thigh. Skin is still itchy months Later. Is that normal? Sometimes my skin will form like a random weird bump in the region where I had treatments. I still have a few more to go. Should I continue? My complexion is darker, more of a dark tan complexion so the laser has taken away some of my pigment and it looks splotchy. Is the random itchiness and occasional bump normal? Should I continue until the tatto is gone? Also I was worried about developing some type of skin cancer if I continue, is that possible? Thank you! I have a neck tattoo that I want removed by the end of November. What treatments would be best for me? I live in South Africa in North West at Delareyville. Will my medicaid/medicare cover laser tattoo removal? I had 2 sessions of tattoo removal and my last treatment was June 2016. It is just black and gray on my forearm. The removal seems to have worked. But now I have sensitivity to sunlight in the area. It gets itchy and swollen. They sent me to see their doctor on site and she did a biopsy to rule out sarcoidosis. But now she doesn't know what it is and has just prescribed me Eucrisa. It looks like this medication is just for swelling and I'm going to have to apply it forever. Please help. I have a small tatoo of the name NAREN. If I want to remove it, will it be more painful than getting another tattoo? I have made a tattoo of the name 'NAREN' it is a small tatoo. if I want to remove it now, will it be more painful than getting another tatroo? I saw improvment after 6 sessions using picoway but had to move and use picsure for my 7th session and tattoo looks darker than before is this normal? Hi. I have been going to see doctors about my tattoo and have been using PicoWay for up to six sessions, and have I've seen marked improvement each time but as soon as I started using PicoSure, I realized that the tattoo got darker like a dark smudge, even where there was little to no ink. Is this ink or just bruising? I don't know where all that extra ink could have come from. Instead of improving, it got worse. Where can I buy TCA? I'm looking for a safe place to purchase TCA to try it on my tattoo. A store or online site is fine with me. Today is Wednesday. I got a tattoo on Sunday, should my skin under the tattoo be raised?